It can be challenging for a retail manufacturer to break into foreign markets, particularly when draconian import duties lead to price inflation and frustrate the growth of the retailer’s brand. Penetrating new geographies can be especially challenging for the luxury goods seller, as a key attraction for luxury consumers may involve where a product is made. Indeed, a country-of-origin effect plays a role in how trust and quality is perceived by luxury buyers. Nevertheless, some luxury sellers are finding solutions to these obstacles, and developing a local presence in emerging markets. Consider Luxottica, the maker of Ray-Ban high-end fashion and sports glasses. Even with some brand recognition in Brazil, the local import tax meant luxury shoppers there had to pay at least twice what the glasses were selling for in Miami. Founded in Italy, Ray-Bans were made exclusively in Italy and China, until recently. Last year, Luxottica bought Tecnol, a Brazil-based eyewear company. The deal included manufacturing and distribution facilities, and an optical retail chain of some 90 stores. With local operations, Luxottica is looking to enhance the luster of its product and market for the growing segment of Brazilian luxury consumers. Without the import tax burden, Brazilian shoppers can now also buy Ray-Bans at a price comparable to what they would pay if they left the country to shop, with local prices around 40% lower than they were only a year ago. Emerging markets represent a growing luxury consumer base. That’s not news to other luxury brands, but without a local presence, or manufacturing, it can be more of a challenge to gain brand recognition. Consider the case of Louis Vuitton, which has had an easier time penetrating the luxury consumer market in China. As described in a previous Perspective, Chinese consumers are particularly brand-conscious and drawn to European brands. Having already established trust with its European manufactured products and brand recognition, Louis Vuitton expanded into China with some 60 stores. By comparison, in Brazil, there are only two. The luxury goods market has more than kept pace with inflation in countries throughout the world. In a 2013 study, Bain & Co. projected that luxury goods revenues could grow 50% faster than global GDP, with 4% to 5% growth in 2013 and 5% to 6% annual average in 2015. One of the key drivers of the trend is the rise of the middle class in emerging markets, Bain found. The runway for growth on luxury items in emerging markets is significant. Brazil, the world’s seventh largest economy in 2012 according to the World Bank, is home to a growing luxury consumer population seeking European brands. 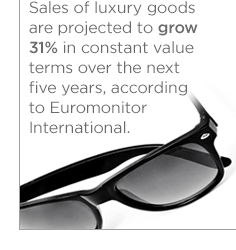 Sales of luxury goods are projected to grow 31% in constant value terms over the next five years, according to Euromonitor International. India represents another opportunity, particularly in the jewelry market, which has not yet been penetrated by brands such as Tiffany’s. But as with Brazil, India’s high import duties may eventually be circumvented by savvy luxury goods manufacturers. 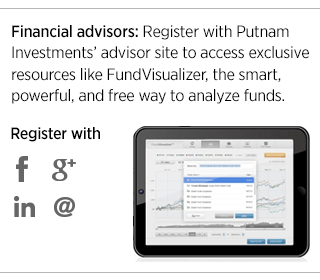 Luxottica was a fund holding representing 1.12% of Putnam Global Consumer Fund as of 9/30/13. LVMH (owner of Louis Vuitton) and Tiffany’s were not held in the fund’s portfolio as of 9/30/13.